Bowing instruments have a very rich and old tradition in India. In folk and tribal music, various types of bowed instruments are found in different regions. Some of them come close to the classical sarangi as far as shape, making and playing techniques are concerned, thus giving clear-cut evidence that the classical sarangi has been developed from these folk instruments. The sarangi, not only in Hindustani classical music, but also in folk music, is the only instrument which comes in closest proximity to the human voice. Many forms of this are in vogue in different regions of our country, but ironically, its place and time of origin have not been established as yet. The sarangi is the only instrument which can produce almost all the nuances of vocal music of any style, be it dhrupad, khayal, thumri, tappa or bhajan or even ghazal, with exact embellishments and intonations. That is why this Instrument has always remained in close association with vocal music, and has always been preferred by vocalists as an able accompaniment. Sarangi players have always been trained in classical music to the extent that some of them have been the ustads of famous vocalists. Some of the most famous vocalists of our times were initially trained in playing sarangi and later on took to vocal music. For example, Abdul Karim Khan, Bade Ghulam Ali Khan and Amir Khan, all distinguished vocalists, originally belonged to the group of sarangi players. Though the sarangi has all the characters of a good instrument, and is very rich in its tonal texture and techniques, it could not attain its due place in classical music. One of the reasons why it could not acquire a respectable place among other classical instruments was because of its association with dancing and singing girls of the lower castes. Here the main attraction of the performance used to be the dancer or the singer, and the sarangi player, no matter how accomplished a musician he was, always remained in the background. Later, when it (sarangi) entered the classical music and started accompanying khayal style of singing, the situation still remained the same. Although the expectations from a sarangi player were very high, his remuneration and social status always remained low. In the latter half of the nineteenth century and the early twentieth century, harmonium (a keyboard instrument) and violin emerged as an alternatives to sarangi. These instruments were easier to handle. The sarangi and the sarangi players slowly became an endangered species. From the beginning of the twentieth century, efforts have been made by many sarangi stalwarts to perform solo on this instrument. Usually the whole length of the sarangi varies between 2ft to 2,25 ft, width 6 inch, height 4.2 inch. It weighs approximately 2 kg. It is hollowed out, chiselled and carved from a solid piece of wood. Usually tun wood is preferred to make a sarangi, but teak or mango wood is also used. The wood is well seasoned (at least for one year) before fashioning it into a sarangi. The belly (pet or pasli) is hollowed out in the front, whereas the neck (chhati) and the head (magaz) are hollowed out from the back. Thus three main portions of the instrument may be distinguished: the body (resonator), neck and peg box. The shape of the body of the sarangi is irregular, with the waist deeper on the left side than on the right. The sound box or the pet is covered with young goat skin, tightly glued along the rim. The main ghurach or the bridge is placed in the middle of the parchment, and is supported by a leather belt (tasma), nailed to the sides of the belly. Inserted in the chhati on the right side are three rows of small pegs (khunti) made of shisham wood for sympathetic strings. The two back rows of fifteen pegs for tuning the main set of sympathetic strings are tied diagonally on the neck under the three main strings. The front row of nine pegs turies the right hand set of sympathetic strings, which run almost vertically down the right side of the neck. The resonance strings attached to the eleven front row pegs mounted on the upper peg box pass through holes in the targahan (upper nut), and are stretched over two small ghurach (bridges) called aankh or tabij. Mostly tarab strings are made of steel, but for lower pitched strings copper wire is preferred. The playing strings are made of gut. The usual material used for these main strings is the goat's intestine. These strings are made in various places but mostly artists get them from Agra. Several guts, i.e. five, six, or even more, are wound together to make one thick string. The first string called sur, tip or jil, the middle string pancham and the third the lowest kharaj. These are tuned in S PS respectively and are of different thickness. While accompanying the female vocalist, middle string is tuned in M.
The peg box has two hollow sections. The upper box has eleven small pegs for the sympathetic strings, whereas the lower section has four larger pegs, three of which are for the main playing strings made of gut and the fourth for a thick metal sympathetic string. The sarangi has three bridges and two aad or nuts, one for the upper tarabs and the other for the main playing strings also called pilak. Out of three bridges two flat small ghurach (called ankh or tabij) are for sympathetic strings and one for main strings. All these were made of either ivory, stag hörn or ebony. Nowadays, due to the non-availability of ivory or stag hörn, components made of even plastic are used by some makers. The main bridge is mostly designed in the shape of an elephant through which all the strings pass. The three main playing strings pass over the bridge, whereas the sympathetic strings pass through small holes drilled into the bridge like the sarod. These holes are drilled at two levels; the lower row accommodates twenty-five sympathetic strings, whereas the upper row accommodates five strings on the left and six on the right. 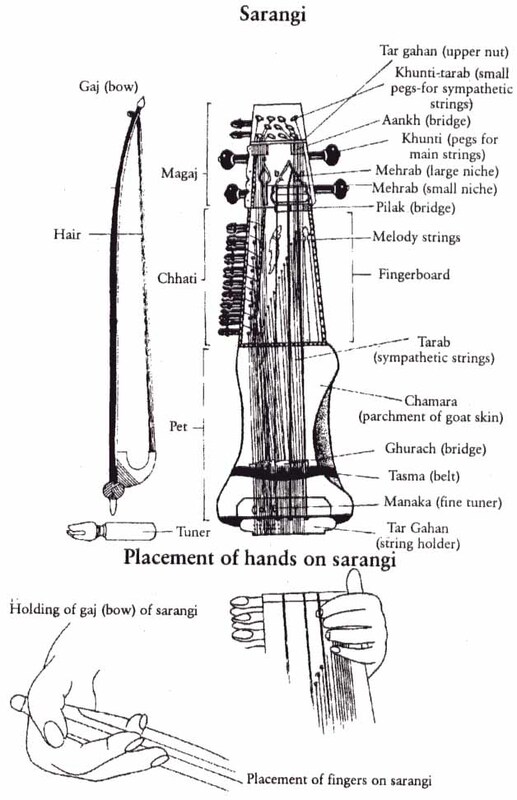 The sarangi gaj (bow) is curved and is at quite a distance from the hair in comparison to the violin's bow. The stick in the past was usually made from ebony which is very hard and heavy. But nowadays shisham is preferred for making bows as artists want a lighter bow. The horse tail hair is about twenty-two inches long, which is variable. The nut is fixed in position by a strong. thread, tied in a crisscross fashion. Rosin must be applied to the hair and a piece thereof is always kept at hand. A tuning handle, called chabi, made of wood and about four-and-a-half inches long, is used to tighten or loosen the tuning pegs of sympathetic strings. The tuning of the sympathetic strings is done in the following manner: the upper eleven tarab strings are tuned to the main raga to be played, the fifteen left side tarabs are tuned to kramik thaat (chromatic scale), the rest of the nine tarabs are tuned to the main swaras, i.e. the important notes of the raga to be played, such as vadi, samvadi and so on, according to the player's choice. The pitch of the sarangi is C sharp Kali-ek, but while playing solos, artists prefer a tuning in F or F sharp. While playing, the artist sits cross-legged on the floor and keeps the Instrument in front of the ehest. Bowing is very important and Synchronisation of bowing with left-hand technique is a most difficult art.Mostly three fingers of the left hand are used in a unique way, and unlike other bowed Instruments, the sound is produced by the contact of string and the root of left hand finger nails, instead of the finger tips, which is a usual practice with most other bowed Instruments.